1) Arsenal 2005/06 (Home) - The shirt from Arsenal's final season at Highbury, so many memories from that season, including Thierry Henry's hat-trick in the final match in a 4-2 victory against Wigan Athletic. The squad that wore this shirt also feature many of my favourite players, which probably helps. 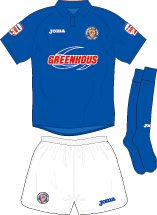 2) Shrewsbury Town 2010/11 (Home) - Similar to my Arsenal selection, this shirt was a celebration of Shrewsbury Town's 125 anniversary, seeing the two shirts side-by-side they're very similar, just different colours. This shirt is genuinely one of my favourites of all time, and one that I've worn on many an occasion. 3) Wigan Athletic 2012/13 (Away) - This feels like a bit of a strange pick, but I really like this Wigan shirt, the black design with the bright yellow appeals to me (don't judge me!). 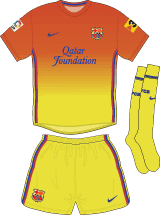 3) FC Barcelona 2012/13 (Away) - Another shirt that I really like, Barcelona's orange to yellow fade, sounds ridiculous, but if anyone can pull it off, Barca can. 5) Paris Saint-Germain 2006/07 (Home) - PSG were one of the first teams I came across playing early editions of Championship Manager and FIFA video games, so I've always had a soft spot for them, and this shirt is very traditional PSG, with a solitary red stripe over the blue shirt. All the images for this blog have been taken from Colours Of Football. Honourable mentions to the scrambled egg shirts of Shrewsbury Town (1992/3) & Norwich City (1992/3), the Team GB shirt worn at London 2012 Olympics and classic Shrewsbury Town (1980/1) from Spinal Tap. 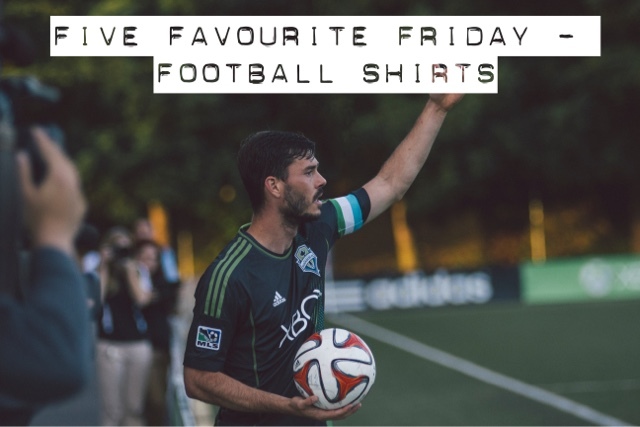 As always, check out my partners post about her favourite football shirts here and let me know in the comments below if there are any shirts I should have considered.